Herd and Owls set to tip at 7 p.m.
HUNTINGTON, W.Va. – On Wednesday, the Thundering Herd men’s basketball team will return home to take on Rice at 7 p.m. at the Cam Henderson Center. The Herd ended a two-game skid last time out with a 78-65 win over East Carolina. In one of the most interesting games of the season, Marshall opened up a 27-point lead in the second half, but a run by the Pirates cut the advantage to just five points before the Herd was able to knock down its late free throws to escape with the 13-point victory. Damier Pitts scored a career-high 28 points in the win at East Carolina. The junior hit 8-of-12 shots, tied his career-best with five three-pointers and connected on seven out of eight free throws. His 28 points marked the highest for an MU player this season and was the most scored in a game since Tyler Wilkerson scored 28 in the road game at UAB last season. Over the last two games, Pitts has averaged 23.5 PPG while hitting eight shots per contest. Rice begins the week with a record of 11-13 and have fallen in three of their last four contests, including a 78-64 defeat at UAB on Saturday. The Owls recorded impressive non-conference victories over LSU and TCU and have posted a 3-7 mark in C-USA play. Arsalan Kazemi leads Rice with 15.9 PPG and 11.6 rebound per contest. Kazemi is the leading rebounder in the league and is fourth in the country in that category. He is also the only player averaging 10 or more rebound in Conference USA this season. Kazemi led the Owls with 17 tallies in the last game against the Blazers while going a perfect 11-11 from the free throw line. 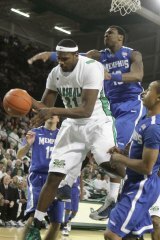 Last season, the Herd faced the Owls squared off in Houston with Marshall taking a 77-54 victory. Chris Lutz led MU with 20 points while Hassan Whiteside recorded 19 points and 17 rebounds. Dago Pena tallied 11 points and seven boards in the victory. Marshall led throughout the contest, taking an 11-point advantage at the half before outscoring the Owls, 45-33, in the latter period. Marshall enters Wednesday’s game with a 4-2 advantage in the series over Rice. The Owls took the first game in the series, but the Herd has won four of the last five meetings, including a 77-54 win at Tudor Fieldhouse last season. Marshall is 2-1 against Rice in games played at the Cam Henderson Center. Promotions set up for Wednesday’s game include a Name-Your-Own ticket price. Fans can pay a minimum of $2 per ticket for general admission to the game. It will also mark Military Night. Anyone with a military ID will receive a complimentary ticket by showing their ID at the ticket window. The Herd will take to the road again on Saturday, traveling to New Orleans to face off against Tulane on Saturday at 8 p.m. Next week, MU is back home for a pair of games, beginning on Wednesday against Tulsa. The tilt against the Golden Hurricane will be televised by CBS College Sports.